Once a jury hands down their verdict, the case is over, right? Sometimes, but not always. At the close of trial, both sides generally have the ability to appeal certain issues or things that may not have gone their way. Most important to remember here though: parties can only appeal legal issues, not factual ones. So an appeal should not be thought of as another opportunity to try a case. Instead, appeals are there to correct mistakes or misapplications of law. Should they determine that a new trial is warranted, appeals courts have the ability to order one. But they are strictly there to determine legal issues, not factual ones. Every state is different, meaning every court system is different. Since this blog covers issues pertaining to the national personal injury community, I will use the federal appeals process to lay out how things work. Granted, the federal appeals courts share some similarities with many states (especially Maryland), so this should give you an idea of how things work from state to state. The federal court system is three-tiered. There are the trial courts, which are referred to as Federal District Courts. 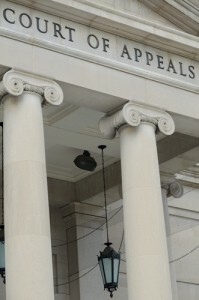 There are the intermediate appeals courts, which are called Federal Circuit Courts. And the “court of last resort” in the federal system is the Supreme Court of The United States (SCOTUS). The state of Maryland has a similar system with trial courts, an intermediate appeals court, and a state court of last resort. 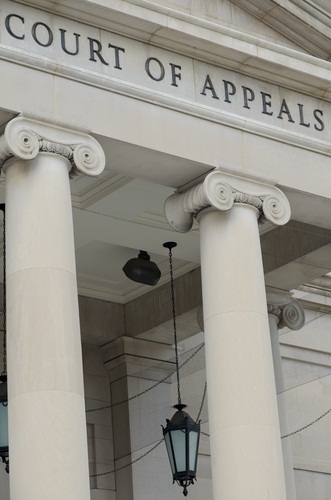 When a case goes to trial and a litigant wishes to appeal a legal issue, they generally have one “appeal of right.” In other words, they have one appeal that must be given to them under the Constitution’s guarantee of due process and access to the courts. In the federal system this appeal of right occurs at the Circuit Court level. At the conclusion of a case, a litigant can file a “Notice of Appeal” with the trial court, which lets them know that they will be appealing the decision. The trial court will then alert the Circuit Court that an appeal is on the way and generally forward the recorded record of the trial to that court. At this point, the parties will be able to submit briefs to the court explaining the legal issue in the case and asking them to rule one way or the other. Parties are also given the opportunity to give oral argument. This is neither testimony nor evidence. Oral argument is a speech of sorts that gives advocates the opportunity to argue points of law to the court. These are generally pretty intimidating given the fact that judges can interrupt attorneys at any point to ask them questions. Intermediate appeals courts generally have several judges who sit on panels of three. These panels of three hear cases and make decisions via majority vote. By having a court sit in panels, they can hear more cases and be more efficient than if each judge heard every single case. After they render a decision, either of the parties can ask the court of last resort to hear their case. As I said before, a party only has one appeal of right, meaning the next highest court has discretion as to whether they want to hear a case. High courts require parties interested in appealing a case to submit a “petition for certiorari.” This document explains the legal significance of an issue. Each side has the ability to persuade the judges to take (or not to take) the case. The biggest consideration for higher courts, however, is public policy. They are not necessarily interested in the individual interests of the parties in a given case. They are more focused on the general issues of law that will have applicability beyond a single case. As a result, the highest courts typically take a very small percentage of cases. For example, the Supreme Court received around 7,600 petitions for certiorari in 2012, and they heard 66 of those cases. That is an acceptance percentage of less than 1%. In state court, you generally have better luck, but the odds are still low. For example, the court of last resort in Maryland grants around 15-20% of petitions for certiorari. One of the reasons that courts of last resort hear so few cases is down to the fact that every judge on the court takes part in making a decision. Each judge reads the parties’ briefs and listens to oral argument, so it would be incredibly inefficient for every judge to hear so many cases. Speaking of decisions, courts of last resort can either affirm the decision of the lower court or overrule it. Regardless of what they choose to do, they will submit a written opinion that lays out the law and why they ruled in a particular way. It is important to note that even if a party who loses at trial wins on appeal, the case is far from over. Appeals courts cannot try cases, meaning they make their legal ruling and direct the lower court on how to proceed at a new trial. The appeals process is long. It usually takes a few years from when the original trial ends to the end of an appeal. Appeals are also very expensive. Partaking in an appeal requires you to produce a written transcript of all trial proceedings. Depending on how long the original trial was, these can cost thousands of dollars. So it is important to remember that the appeals process is a long and expensive one that deals with legal issues, not factual ones. However, it ensures that there is (some) uniformity among the various courts and that judge-made law is as consistent as it can reasonably be within a jurisdiction.